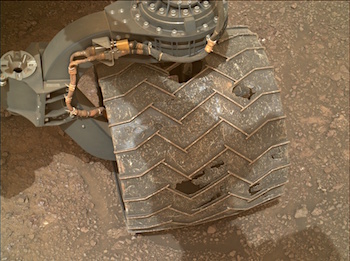 Sols 2293-94, January 17, 2019, update by MSL scientist Michelle Minitti: It has been a productive stay at the “Rock Hall” drill site. The number and diversity of analyses performed on the drill target and drilled sample itself – mineralogy from CheMin, organics and volatiles from SAM, chemistry and spectral characteristics of the bedrock, drill tailings and excess drilled sample from APXS, ChemCam, and Mastcam – speak to the importance of samples we so painstakingly extract from Mars. After acquiring an image of the drill hole using MAHLI to pinpoint APXS’s placement over the drill tailings the evening before, we depart for our next adventure – the clay-bearing unit. This unit, which lies between us and the next set of mesas further up Mount Sharp, exhibits a strong spectral signature of clay minerals from orbit. As clays are associated with the action of water and, typically, that of neutral pH waters, we are keen to learn about the nature and origins of the clays and the rocks that host them. This entry was posted in Reports and tagged Aeolis Mons, Curiosity, Curiosity wheels, Gale Crater, Mars Science Laboratory, Mount Sharp, MSL, Murray Formation, NASA, Rock Hall, rover wheels, Vera Rubin Ridge, wheel wear. Bookmark the permalink.